1. What is to be produced and in what quantities? The first central problem of an economy is to decide what goods and services are to be produced and in what quantities. This involves allocation of scarce resources in relation to the composition of total output in the economy. Since resources are scarce, the society has to decide about the goods to be produced. Wheat, cloth, roads, television, power, so on. Once the nature of goods to be produced is decided on the basis of priorities or preference of the society. If the society gives priority to the production of more consumer goods now, it will have less in the future. A higher priority on capital goods implies less consumer goods now and more in the future. 2. How to produce these goods? The next basic problem of an economy is to decide about the techniques or methods to be used in order to produce the required goods. 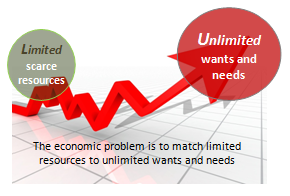 This problem is primarily dependent upon the availability of resources within the economy. For example: If land is available in abundance, it may have extensive cultivation. If land is scarce, intensive methods of cultivation may be used. The technique to be used also depends upon the type and quantity of goods to be produced. For producing capital good and large outputs, complicated and expensive machines and techniques are required. On the other hand, simple consumer goods and small outputs require small and less expensive machines and comparatively simple techniques. Further, it has to be decided what goods and services are to be produced in the public sector and what goods and services in the private sector. But in choosing between different methods of production, those methods should be adopted which bring about an efficient allocation of resources and increase the overall productivity in the economy. 3. For whom are the goods produced? The third basic problem to be decided is the allocation of goods among the members of the society. How should the consumer goods be distributed? How should the capital goods be distributed? The allocation of consumer goods among the house holds takes place on the basis of exchange. Whosoever possesses the means to buy the goods may have it. A Rich person may have a larger share of the goods he requires, and a poor person may have lesser quantities of the goods he needs. The allocation of capital goods takes place according to the needs of individual industries, whether they belong to the public sector or the private sector. Since the supplies of certain consumer and capital goods are short in relation to their demand, the government also intervenes to allocate them equitably through price controls, rationing or quotas. 4. How efficiently are the resources being utilized? This is one of the important basic problems of an economy because having made the three earlier decisions; the society has to see whether the resources it owns are being utilized fully or not. In case the resources of the economy are being idle, it has to find out ways and means to utilize them fully. If the idleness of resources, say man-power, land or capital, is due to their mal-allocation, the society will have to adopt such monetary, fiscal or physical measurement whereby this is corrected. 5. Is the economy growing? The last and the most important problem is to find out whether the economy is growing through time or is it stagnant. If the economy is stagnant, the economy must produce larger quantities of consumer and capital goods. This is possible through a higher rate of capital formation which consists of replacing existing capital goods with new and more productive ones by adopting more efficient production techniques or through innovation. Economic growth enables the economy to have more of both the goods. All these central problems of an economy are interrelated and independent. The first three relate to micro economics and the last two to macro economics. The former make-up the problems of the stationary economy and latter of dynamic economies. They stem from the fundamental economic problems of scarcity of means and multiplicity of ends which lead to the problem of choice or economizing of resources. The solution of these five basic problems lies in price mechanism.